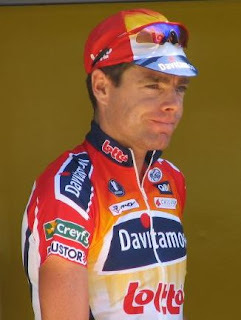 Pic from Cadel Evans’ Wikipedia entry. He needs to pick up 1 min 50 secs on current leader Alberto Contador to be the first Australian ever to win the race. Evans has to defend a 59 sec lead over 3rd place holder, Levi Leipheimer. I’m wearing my Davitamon-Lotto jersey to right now to show my support. Déjà vu just under a year after this. Yesterday, I think I had the best time I’ve had while standing up that I can think of in recent memory. I make the trek to London to watch the Prologue stage of the Tour de France accompanied by Gerard, Lucas and Aileen. It was a bit of a fraught bus journey in the morning as a lot of roads were closed in central London, so it took the bus a lot longer than usual to set us down in Victoria. From there, it was a short stroll along car free roads to take up a position on Constitution Hill, behind Buckingham Palace. We were mid-way between Hyde Park Corner and the Flamme Rouge, the red pennant that marks the 1km to go line. I thought this a good place to watch the 7.9km individual time trial, grand-stand kick-off of the Tour as the cyclists passed by once on the way out and once on the way back. Despite the fact that an estimated 1 million plus spectators were around the course, we got there early enough to be close to the front of the barriers and after a time, I even managed to get a spot right at the front. 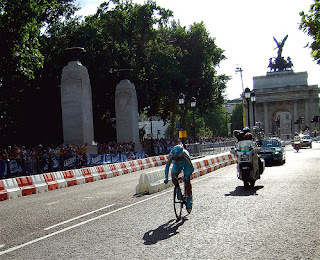 This gave me a good view of Stuart O’Grady overcooking the bend at Hyde Park corner and going for a tumble. You can see Stuey on his arse in the photo below. Stuart O’Grady crashed at Hyde Park Corner with 1.2km to go. This was unfortunate as he had ridden well and had the fastest intermediate time of all the competitors until that point. Also, I picked him for my fantasy cycling team for that stage and of course, he’s Australian. Indeed, I cheered myself hoarse for all of the Australian cyclists including Robbie McEwen, Brett Lancaster and Michael Rogers. I cheered loudest for my home-town favourite, Cadel Evans and was quite chuffed when during the build-up to the race, he gave a wave in my general direction as he hopped over the central barrier to do another reconnaissance lap of the course. I like to think that it was prompted by me yelling “Cadel! !” at the top of my lungs! I also lent my support to the British cyclists, Bradley Wiggins (who finished 4th), Mark Cavendish, Geraint Thomas and Charlie Wegelius. I clapped politely for David Millar but I’m not a big fan because of his chequered past. Anyhow, no-one could match the power of Fabian Cancellara, the reigning World Time Trial Champion on the day, who took the Prologue in a time of 8min 50secs, covering the 7.9 km course at an average speed of 53.7 km/h!!!! A fine beer capped the day off nicely, before hopping back on the Oxford Tube. Now, I’m typing this watching the peloton on TV as they speed their way through Kent on the first proper stage…still with a big smile on my face from a really enjoyable day out. For a cycling nut like me, it’s like Christmas in July!!!! Equally as good as watching a mountain stage of the tour on the Col du Galibier with Damon in 2005!